there are some errors in it though. for example the H2 is listed as having 2 channels while in reality it has 4 microphones and records to 2 x stereo. but still, a very nice graphic! I have an Olympus digital voice recorder (VN-5200PC). It works very well and costs $50 in radio shack. Be aware, the VN-6000 doesn't have a USB connection so you can't easily transfer sound clips to your PC. Get the VN-5200PC version. Just waiting for them to be approved. Zoom H1 is very nice, and price is right. my shock-mount holds the H1 with 3 rubber o-rings, and aluminum suspension frame has 1/4" x 20, ALL steel insert for tripod. I'm anxious to do more tests with it. 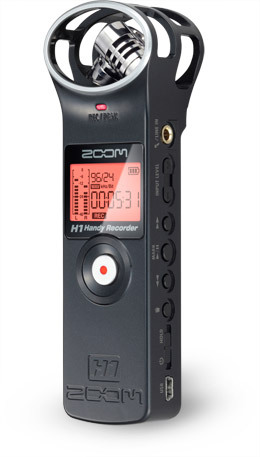 Here it is: Zoom H1 Portable recorder. Both are good. but the Sony has far more quit mics, but is 500,00. The zoom is 99 . I have one fore sale for a reasanable price ..
Where would it be recommended to buy many of these products. A simple DJ store store doesn't simply just have it. In my case, Costa rica has narrow access and they literally come double the price. yet since im currently in New York i would like to explore my chances. You're unlikely to find it cheaper or with better customer service. Actually I've never bought from B&H myself but I've got years of experience as a Sam Ash customer and I love them. I had an Olympus Pearlcorder Micro Casette Recorder. It had a built in speaker and it had pause, rewind, play, and fast forward. It also had the ability to record in half speed. It was aq great little recorder for it's time, and it lasted me about 5 or 6 years. But they are very outdated, since they will never fit into the digtial world.........Just lettin' you guys know. Send me a personal Message if ya want. Thanks. I use a zoom h4n. good sound and some very useful utilities like the divide tool. i'm looking for another recorder more "portable", someone can submit a comparison between olympus ls-11 and zoom h1? I am considering zoom H2. What I really don´t like about it is that it still needs AA batteries to work, It comes with the AC power supply, but it does not mention rechargeable battery. Other that that I have read good things about it and it seems like a solid buy! I've got to say, this chart is probably good for people looking to purchase equipment at the very low end of what it describes; for anyone who might be considering shelling out $2000 for a Sound Devices recorder, though, you'd probably want at least one extra column: the preamp signal/noise ratio. After all, this is one of the things people spend endless time/money tweaking and correcting at the professional end of things. other than possibility of connecting professional microphones? I still use the old H4, not the H4n, and it is almost useless outdoors because of its extreme wind sensitivity (one can make a custom dead cat for it though. The H4 isn't very well though of anyway; the handling noise is really bad as well, the menu is counter intuitive (I have it 10 years or so and still make mistakes which button to use for what) and it's almost impossible to change the batteries and flash card when mounted on a stand. Furthermore: the internal clock is really bad. That once broke me up when recording a downmix and live audience during a live DJ set... Horrible! I'm thinking about a new one but am not sure which one would fit the bill. Most important for me is low self noise, good stereo mics and low wind sensitivity. I'm even considering an iPhone mike solution like the Tascam iM2X XY in combination with a Røde dead kitten. And I've tried the Zoom H4 with a Røde Dead Kitten and it works perfectly!